Rehabilitate through play is my graduation project for the Bachelor Design for Virtual Theatre and Games (Utrecht School of the Arts). The concept for this project reflected on a period when I had an accident and broke my elbow. I had to do a monotonous training exercise to rehabilitate, using a machine which helped me to stretch my arm as far as I formerly could. The question arose, would it be possible to make an exercise such as this more interesting by adding for example an element of timing, thus creating a game? 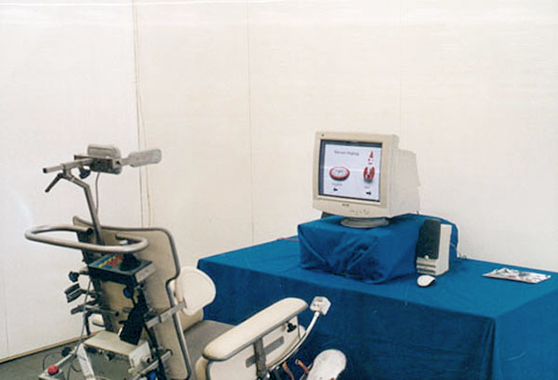 While doing research on rehabilitation, I learned about a company named Adremo, which makes electric wheelchairs for people who mainly have control of movement of their head and feet. 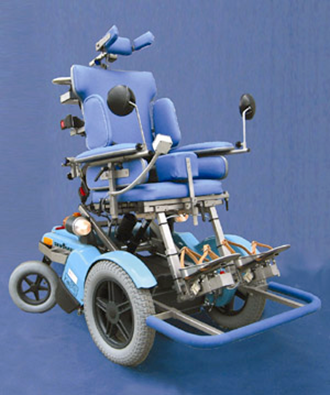 They can steer the wheelchair using big switches on the left and right of their head, and accelerate/brake using switches below their feet. The interesting thing about these wheelchairs is that they have the possibility to be connected to a computer. For me this was appealing, because this way you could say the whole wheelchair could act like a joystick. Adremo was very helpful in contributing to this project, and we decided to make a game for spastic children, their biggest user group. Because Adremo also trains spastic children to drive these wheelchairs, they had a lot of knowledge to share about what I had to take into account while making the game. Obviously the players don’t have very good control over their movements, but this gets even worse when they get enthusiastic. Enthusiasm of course shouldn’t result into losing the game. I decided to make a ‘flying’ game in which you couldn’t lose or get stuck. 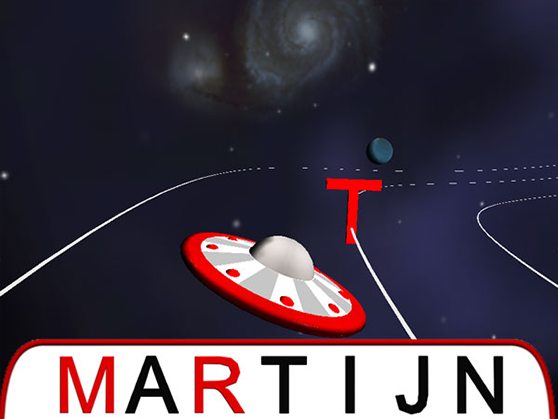 The goal of the game is to collect the letters of a name/word which the players can enter themselves using the switches next to their head, or which is typed by a supervisor. These letters are spread over a ‘track’, which consists of three lines. You can’t stray off these lines, so you can never get lost or get stuck. If you fly over a letter, you get rewarded with a small animation. There are also asteroids spread over the track. If you hit one of these, your spaceship starts to shake for a short moment. You finish the game when having collected all the letters, getting fireworks as a reward. 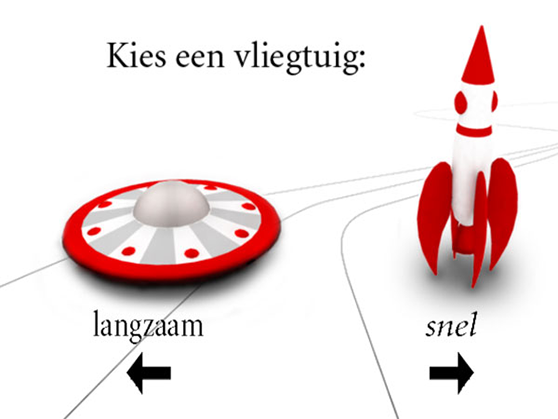 There are two difficulty levels, you can choose the slow UFO or the fast rocket.